More body parts have been discovered close to where hikers stumbled across a severed human head along a trail below the famed Hollywood sign. Two human feet and two hands were found on Wednesday afternoon after Los Angeles Police Department (LAPD) launched a murder inquiry. 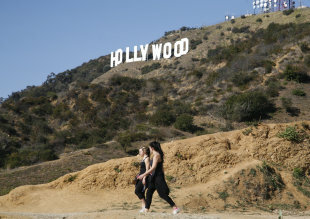 The head, which is believed to belong to a male between 40 and 60 years old and of ‘undetermined’ ethnicity, was found in a bag by two women on Tuesday at 2.30pm (local time) after their dogs started playing around in some shrubbery along the Hollywood Hills hiking trail. Both hands and feet were found within a 50-yard radius of the head and are believed to belong to the decapitated body, the LAPD said. Detectives believe the victim – whose identity still remains a mystery – was killed elsewhere before the perpetrator dumped the body parts near the iconic sign. Police said wild animals roaming in the Canyon Drive area may have moved the body parts. Upon making the grim discovery, the pair alerted the Canyon Park rangers, who then notified the police. According to police, the murder may have occurred recently due to the “absence of animal bites and decay”. “Two of the dogs began to play with the bag and what appeared to be an object. While the dogs were playing with it, at some point the object came out of the bag and they discovered that it was a head — a severed head,” Sergeant Mitzi Fierro told KCAL-TV. Detectives from Los Angeles Police Robbery and Homicide Division are seeking help from the Los Angeles County coroner in order to identify the victim through dental records.